This Saturday marks the third time that Juan Manuel Marquez and Manny Pacquiao will face off in a series of fights that have already produced two of the most memorable confrontations in the past decade. The first fight featured Juan Manuel Marquez picking himself off the canvas three times in the first round to battle back to a draw in one of the more courageous performances you will ever see. The second fight was no less memorable or controversial than the first, seeing Manny Pacquiao winning a one point split-decision victory in a rematch that many people, including myself, believe Marquez actually pulled off. Tonight, the two warriors will try and settle the score once and for all. Since their last match in 2008, both fighters have maintained their status as top level, world-class fighters. Marquez has settled in to become the kingpin of the lightweight division, while Manny Pacquiao has risen to a level of global boxing icon. Despite how close the first two matches were, Las Vegas sportsbooks have pitted Manny Pacquiao as a nearly 10-1 favorite in this upcoming match. To the casual observer, these odds may look lopsided at first glance. When we take a closer look, however, we can see why Pacquiao deserves being such a considerable favorite. Nine months after his highly disputed win over Marquez, Pacquiao had his coming out party with a dominating performance over Oscar De La Hoya. He then returned to the 140-pound division and disposed of Ricky Hatton in two rounds with a majestic left hook. Since then, he permanently moved up to the welterweight division and has hardly lost a round since moving there. His power hasn't translated to that many KO's over these fights, but in his defense, he has faced a number of fighters that are naturally much bigger and some, like Joshua Clottey, who simply refused to engage with him. So although it is uncertain how his power may translate at 147, one thing that is not in question is that he still has the lightning fast hand speed that he had at lower weights. For the most part, Juan Manuel Marquez has stayed at 135 pounds for the past three years, except, of course, for his 2009 fight against Floyd Mayweather, one in which he lost every round and was lucky to not get KO'd. It was clear in that fight that Marquez was not fighting at his best weight. He looked like he had bricks in his boots and his punches were slow, having little effect on Mayweather. Ultimately, he was outclassed by a bigger, better, and faster fighter. Even at 135 pounds, Marquez is there to be hit. Since 2008, he has been in wars against Juan Diaz and Joel Casamayor, and hit the canvas against a faded Michael Katsidis. Over the years, he has developed from a deliberate counter puncher to a fighter who is not afraid to square up and be first. This Saturday's match should be exciting...while it lasts. 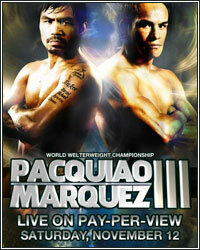 I just don't think Marquez has the physical strength to compete against Manny Pacquiao in 2011. The catchweight for this fight is 144 pounds. While that is 3 pounds less than the 147 pounds that Marquez had to fight Mayweather at, it is still 9 pounds heavier than Marquez should be fighting at. Meanwhile, 144 pounds is probably the ideal weight for Pacquiao to be fighting since he usually comes in a few pounds below the welterweight limit anyway. What does all this mean? It means it's going to be a long night for Marquez, or perhaps I should say a short night. I just really don't think Marquez has the physical strength and speed to keep up with the faster and stronger Pacquaio. Word from the Pacquiao camp are saying that he is training harder for this fight than any fight he has ever had. Clearly he wants to prove once and for all who the better fighter is, making a statement before going into what is likely to be another tedious negotiation period with the Mayweather camp following a victory. Like I said earlier, it should be fun while it lasts. I don't expect it to last long, however, which is why I recommend betting on Pacquiao to win inside the distance at a price of -135. Good luck.